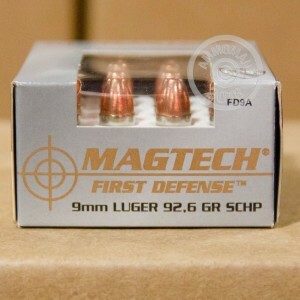 You can count on Magtech First Defense ammunition to perform if you're ever forced to use your carry weapon in self-defense. 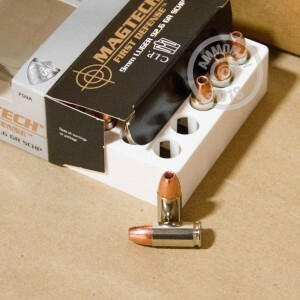 Each 9mm Luger cartridge in this box of 20 fires a light 92.6 grain solid copper hollow point bullet at a high muzzle velocity of 1,330 feet per second. This high velocity provides more reliable expansion. Magtech ammunition is made in Brazil by CBC, one of Latin America's top defense contractors. CBC produces all of its own components including non-corrosive Boxer primers and reloadable brass cases. Buy as much ammo as you need at AmmoMan.com, where all orders over $99 ship for free!